"There is no Eucharist without the Priest"
Our three parishes are part of what has come to be called a "cluster" or "linked parish" arrangement. Ideally, each parish would have at least one priest to serve its people. In order for this to become a reality once more, we must beg God to knock on the hearts of our young and encourage their response within our families. Use this prayer in your home to ask God to provide religious for His Holy Church. LEADER: Please kneel for our prayer for vocations. Let us as God to give worthy priests, brothers, and sisters to His Holy Church. 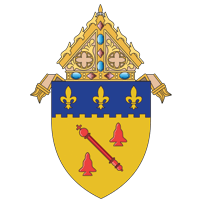 ALL: O God, we earnestly beseech Thee to bless this diocese with many priests, brothers and sisters, who will gladly spend their entire lives to serve Thy Church and to make Thee known and loved.